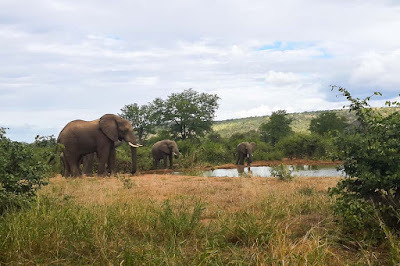 As we mentioned in part 1 prior to staying in the Kruger National Park, we spent 3 nights at the Forever Resort in Phalaborwa, due to the park being full. However, this gave us chance to visit friends in Phalaborwa we hadn’t seen in years and allowing us a day visit into the park to Letaba rest camp, one of our favourite Kruger camps. The area around Letaba, and moving up to the Northern part of the park is dominated by Mopani bush, a favourite for the parks elephants and we were surprised at just how many elephants we were actually seeing. The most abundant large mammal species in the park are Impala (Aepyceros melampus), a staple diet of the large predators, however we kept saying we were seeing more elephants than impalas, so you can just imagine how many elephants we were seeing. Not that we were complaining as one can spend hours just watching the interaction between these African Elephant (Loxodonta africana) family members, especially when there is a breeding herd with very young calves. With most of the migrant birds having left South Africa, we were very surprised to find a pair of Woodland Kingfisher (Halcyon senegalensis) in Letaba Camp as these intra African migrants are usually gone at this time of the year (mid May). South Africa and the Kruger Park have for the past 2 – 3 years suffered from a serious drought but this past year has seen a bit of a recovery in the park which has resulted in an inundation of Red-billed Queleas (Quelea quelea). 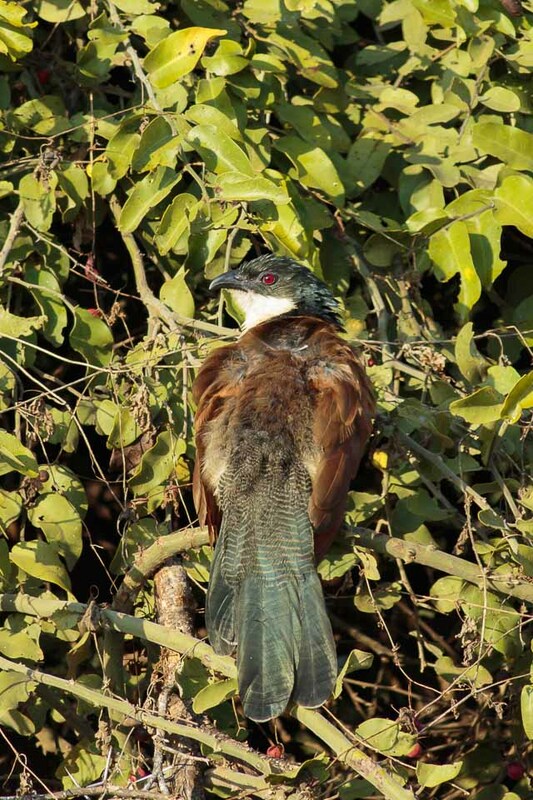 In all the years we’ve been travelling into the park we have never seen quite so many flocks of Red-billed Queleas swooping through the trees in waves. It has been caused by the apparent late rains late last year and early this year and thus an abundant supply of grass seed. We were also pleased with the number of Southern Ground-Hornbill (Bucorvus leadbeateri) that we saw considering these are regarded as a vulnerable species in Southern Africa, they do however seem to be thriving in the Northern part of the Kruger National Park particularly. 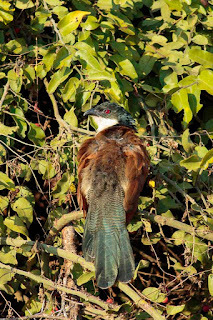 Another plentiful sighting were Burchell’s Coucal (Centropus burchellii) and in one day alone we counted 9 which for us was some sort of record. Eventually the day dawned for us to move into the Kruger Park and travel from Phalaborwa gate up north to the furthest camp, Punda Maria. Arriving there mid-afternoon after a pleasant drive, counting elephants and Burchell’s Coucals with sightings of the plains game species like, Impalas, Burchell’s Zebra (Equus burchellii) Giraffe (Giraffa camelopardalis) and a few Greater Kudu (Tragelaphus strepsiceros). This was the first time we’d camped in Punda Maria having previously stayed in the chalets and permanent tents. The camp site is a real treat as the bird hide is located in the camp and it overlooks a beautiful waterhole. While setting up camp a large herd of elephants came to drink, a great opportunity to take some photographs as they were bathed in soft golden afternoon sun a photographers dream. I stopped what I was doing and rushed to the bird hide to watch them. A fellow traveller advised me they’d been there every day for the last 4 days at the same time. As I was in the middle of setting up camp I thought I might as well catch them the following day. BIG MISTAKE, I was never to see them again in such numbers and in such awesome light in the whole 6 days we were there.. Great opportunity missed. (Lesson: Never leave for tomorrow what can be done today, take your opportunities as they arise). One small consolation was the small video footage I took on my mobile phone of the event, which I will share on my website www.africanwildlifeandnaturephotographs.com later. The elephants were constant visitors to the waterhole though and the sounds of elephants communicating in the middle of the night is quite something. Besides the elephants we were lucky to hear and fall asleep to lions roaring every night, but they proved to be elusive when trying to find them during the day. 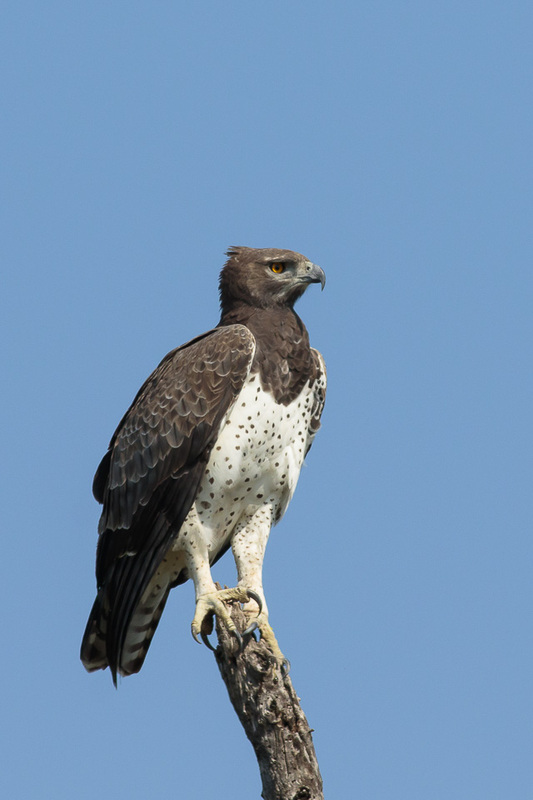 The advantage of staying in Punda Maria is that it is only an hour’s drive to the Pafuri area, which is one of South Africa’s most prolific birding spots throughout the year , albeit missing the migrant birds in winter. Again, this trip didn’t disappoint with good sightings of African Crowned Eagle (Stephanoaetus coronatus), Martial Eagle (Polemaetus bellicosus) African Fish-Eagle (Haliaeetus vocifer), Meves’s Starling (Lamprotornis mevesii) White-fronted Bee-eater (Merops bullockoides) and White-crowned Lapwing (Vanellus albiceps), to name a few. Now for a little moan and word of warning; so please take note…we enjoyed Punda Maria for its great location and the wonderful Mahonie Loop around the camp for late afternoon game drives, however the downside of the stay was that the camping was full, possibly overbooked and the camping area was like a car park in a shopping centre, but not as organised…. It’s a free-for-all for campers, hence people camping extremely close together, having access to power when not paid for with no control or checking by Sanparks who run the camp. We also soon realised that we were in a pensioner’s discount period (Sanparks have them a couple time a year) meaning there were far too many people camping in the Kruger Park due to its warm winter climate and no doubt cheaper utility costs. Unfortunately, in our opinion, not that interested in the parks wildlife either as some people just parked up and didn’t bother leaving camp, it would seem. Sanparks, Punda Maria camp is one camp that should have restricted camping numbers, frequent checking on who has camped where and paid for what. Sadly also there are too few ablutions based on the numbers allowed to camp with some in a poor state of maintenance and repair. So it was time to say farewell to Punda Maria and head off further south to stay in Letaba and Orpen camps and visiting our previous ‘home town’ of the past few years; Hoedspruit.